The Florida Bright Futures Scholarship helps students across the state with free money for college – if you are in Florida and you follow the eligibility requirements it can help you pay for college too! The program is split up in to various awards, based on the student’s academic track, grades, and test scores. Find the award you’re most likely to be eligible for, then be sure to complete all of the required classes. Yes, you can get a scholarship to attend a Florida college even if you’re in a vocational program and you want to further that vocational training to a degree in the field or specialty – or heck, even if you want to do something completely different. Standardized Test Scores: 440 in BOTH the Math and Critical Reading Sections of the SAT; OR ACT scores greater than or equal to a 17 in English, an 18 in Reading, and a 19 in Math. This award is worth a little more if you’re going to a community college, but the payout is basically the same as the Vocational program scholarship. The major difference is the classes required to achieve eligibility: Students pursuing the Medallion version of the Florida Bright Futures Scholarship will be required to take a foreign language AND two of their sciences with a lab component. Standardized Test Scores: 970 or higher on the student’s best combination of the math and verbal sections of the SAT. You could get a 490 in each section, or a 500 in math and a 470 in verbal. Any combo works to secure eligibility. The listed ACT score is 20 (not including writing). This foreign language requirement is the one that gets people in trouble. Some people will take Spanish 1 and French 1 – but they will NOT qualify! You have to take two levels of the same language. One friend of mine did not qualify because the language they had taken in another country did not count. Another friend was disqualified for not taking a language. They WILL NOT let you get around this requirement. It is incredibly important and will ruin your eligibility for all four years of college if you do not complete it. Take your two languages, and take them early. It will help you on the English section of the SAT (really!) and you’ll probably be glad its out of the way. Up to $125 per credit for four year degree programs and $86 per credit at public community colleges. Standardized Test Scores: 1270 or higher on the student’s best combination of the math and verbal sections of the SAT. You could get a 640 in each section, or a 500 in math and a 770 in verbal. Any combo works to secure eligibility. The listed ACT score is 28 (not including writing). See the note in the above scholarship award regarding the language classes required for eligibility. I’ve known several people who got caught up on this requirement and missed out on a few thousand dollars because of a technicality. To be eligible for the big award, you need 100 hours of community service approved by the school district or the student’s private school. This is also not negotiable. Like the language, I recommend doing this early. Community service will give you great experience, a rewarding sense of accomplishment, and a chance to help out someone or someones in need. Oh yeah, don’t forget – it will help you qualify for and win even more scholarships, other than the Florida Bright Futures! Don’t put it off to the last minute because you’re “not sure” if you’ll make the other qualifications like SAT scores and grades. If you’ve invested in the 75 hours of community service, you’ll have more motivation to keep the grades up and study hard for the SATs and ACTs. Its worth 25% of your tuition – and that’s money that could be used to buy a car, a laptop, or it could even be the difference between needing small student loans or no loans at all. I was going to wish you good luck in your quest for a free college education but I decided that was silly because luck has nothing to do with it! The premise is simple. Florida will help to pay for your college tuition if you can use your high school years to prove that you’re willing to work hard and follow instructions. If you’re that type of person, society wants you to succeed – heck, we need you to succeed. At a public university in Florida, 75% of tuition doesn’t seem like much (since the tuition is so low to begin with) but it is an incredible deal when you realize you only have to pay out about $1000 for a full semester’s worth of classes and textbooks. Many semesters, I would pay more for my books than I did for the classes! That’s a deal – and the government is willing to give you that same deal if you can get decent grades and follow the correct course of study while you’re in high school. Grades and SATs aren’t everything – and two of my friends learned this the hard way. Their high school financial aid counselors weren’t up to date on the eligibility requirements and they ended up being disqualified on a technicality. Don’t let this happen to you! Since the criteria for selection is completely based on high school scores and classes, there is no way to appeal Florida state’s decision after you graduate high school. Maybe some day in the future, Florida will be ready to hear appeal cases and reconsider these decisions, but as long as budget constraints and low tax rates stay remain top voter priorities, our representatives in Tallahassee will be looking to save costs anywhere they can. Unfortunately, this means a lot of students won’t qualify for the scholarship due to technicalities like missing a certain credit, filing the forms late, or not getting the proper forms to where they’re supposed to be. Make sure you work with your guidance counselor, but don’t stop there: the ultimate responsibility is with the student. These are the people who contribute major breakthroughs that advance society, these are the people who build businesses that employ others, and these are the people who love a challenge because they love the rewards of overcoming obstacles. Start before you’re even a freshman in high school. Sign up for language classes before you even see your new school. Study hard. Do your homework. Then, when you’re within one year of graduating, fill out the Florida Bright Futures application form at www.FloridaStudentFinancialAid.org. The only thing you will regret is if you let this great opportunity for free money pass you by. Not Eligible? Not Enough Money for College? If you’re not eligible or if the Florida Bright Futures Scholarship isn’t going to cover all of your costs in college, make sure to sign up for other scholarship search services like Fastweb and ScholarshipExperts.com. There are so many shcolarships and awards out there that you won’t ever know what is available for you to apply for unless you go out and look! For the requirements, can you just have the 3.5 grade point average and still receive the Florida Scholar Academic Award? Or do I need to have the SAT and ACT score as well? To be eligible, you’ll need to meet the GPA requirement and test score requirement, but you can meet the test score requirement in either the SAT or ACT. What about students who are home schooled? I had heard from a counselor that you would have to be home schooled for 2 full years prior to graduation to be able to receive Bright Futures. I took the ACT (without Writting) I can still get the 75% from that score, Right? Does Florida International University accept the Florida Medallion Scholars Award – 75% of Public College/University Tuition? Betsy: Try as I might, I can’t find that information. According to the FL statutes, home schooled students are eligible for the program as long as they are following the guidelines of the home education program. Jenn: Writing is not required currently for ACT/SAT scores, so that should be good. Leslie: Yes, FIU is a public university and Bright Futures will pay 75% of tuition. I think any school will accept the state government’s scholarship check, it is just that the private ones will want that and a whole lot more, too. Do you know if Algebra 2 is counted towards Bright futures criteria? I have taken Alg1, geometry, and Liberal Arts math, would those count as my 3 core credits? Yes, liberal arts math counts as a math credit for the purposes of scholarship eligibility. I was a little late in planning for this and did not get either language credits or an arts credit, do you know if I were to take a summer course in arts, would i qualify for the 75% and then take the foreign language courses in college and qualify for 100%? Does anyone know if Algebra 2 counts as a math credit? Tyler you’ll need to get those credits before you graduate unfortunately. I really wish counselors would introduce students to this program earlier, and I always recommend high schoolers to start planning ASAP. Pass the word along to your younger friends and good luck with finding a summer program that can fit your needs. Francisco: Algebra 2 definitely counts for math and it will also help you be prepared for college algebra. Good luck everyone I’m going to my best friend’s wedding! Laura those college classes aren’t going to count as a vocational program, the best bet is to practice and re-take the SATs. James, yes but only an amount based on 75% or 100% of the tuition of public universities. UF is public by the way. How are AP/Honors and dual-enrollment grades determined? Florida’s current statutes call for a .5 weighting to be added to advanced courses like the ones you’ve described, Mary. So yeah, the GPA used for consideration is a weighted one. Do I have to maintain a certain GPA in College for the Florida Medallion Scholar? I went to my school’s (UNF) financial aid award screen, and it said I am only getting about $2800 from the 75% Medallion award, and thats hardly 75% of the tuition and fees. Whats wrong with that picture? John: Jason, when I went to UNF the financial aid award screens always tried to estimate Bright Futures in advance when the money is actually dispersed after you pay for tuition. They might be calculating fewer credits than you intend to actually take. If you go pay them 25% before tuition is due there shouldn’t be any holds. Do you know if our daughter must attend high school in Florida for all four years? We currently live in Nashville, TN but are considering relocating back to Florida. Our daughter will be entering 9th grade this fall and it may help determine whether we need to go ahead and move back this summer. One thing to be aware of though is how high school classes transfer, especially language classes. Florida will require two years of the same language and the high schools here might not necessarily take a half-transfer since each school has different language programs available. I would like to attend Full Sail University when I am finished with high school, is the Bright Futures scolarship applicable there? John: This is a tough question! Full Sail just recently attained official state “private University” status. Technically, I think this makes the school eligible – but I would double-check with them to make sure they have the financial aid infrastructure to handle payments! Also, keep in mind that while Bright Futures may help you with tuition here, the total that the state will pay is only 75 or 100% of public university tuition. So for example: if FSU costs $5,000 a year and Full Sail costs $50,000, you will need to find $45,000 from other grants, scholarships, or loans. Make sure to check out the Fastweb scholarship search on the left or the search we have on our site in the upper right corner. Fastweb will help you set up a personal profile and filter their database that way, our search will let you focus in on a few key factors you want to emphasize like your school, major, hobbies or whatever you think is unique and compelling about yourself. I’ve been constantly surprised at how many ultra-specific tuition programs are out there, just looking for the right students. John: No need to apologize! The version of the scholarship any student gets depends on what your high school transcript looks like. If you took a vocational track, you would apply for that version of the award and if you took an academic track you would get the best one available for your grades. My Daughter wants to attend a University outside of Florida. Will the bright Futures program treat this as a “Private” school and pay a prorated rate? I was awarded the Gold Seal…does anyone know if I attend a public community college does it still pay 100% or is that only for the one above Gold Seal?? John: The Gold Seal award is always only 75% 🙁 If the Florida education budget wasn’t already in big trouble, I’d say its something worth writing the legislators about. I was wondering if you could name the Natural Science courses required? Just a list of some would be great. Our daughter took Physical Science 1 credit, Biology I with a lab 1 credit,and also took Marine Biology with a lab also for 1 credit. Do those count as the 2 labs required in the Natural Science category? John: Any science class that specifically gives lab credits counts toward this requirement. So in this case, Biology and Marine Biology would do the trick. John: Unfortunately they don’t currently count writing for this score. You could try re-taking the SAT, it is very easy to get a few extra points since each time you are a little bit more familiar with the way the test works. You might also be amazed at how much difference a few small things like how you eat can help you get higher scores! Whew! I missed a week and now I have a lot of questions to answer 🙂 For the sake of keeping things organized I’m going to edit the comments and respond directly on them. Please check your original comment for more info! I earned the GPA and SAT requirements for the 100%, and I turned in the volunteer forms a month before graduation. My guidance counselor said that because I did not turn in the forms by the beginning of senior year, I would first be notified that I had earned the 75% and then my status would be changed as soon as my forms were processed. Is this true? And if it is, when should I expect my award status to be updated? Applications need to be turned in between Dec.1 and before graduation so it sounds like the school was trying to collect the information early so they could have it all in ahead of time. If the guidance office managed to get your updated application in before you graduated, then they should be able to process that data before your freshman year at college begins. Otherwise, as far as I know, there’s no way to change which award a student is given after the first payments are made. So unfortunately, it sounds like a lot of room for bureaucratic error. I would try calling them at 1-888-827-2004 to make sure they have the updated information on file with your application. If not, they might be able to help you get everything squared away. My son qualified for the 75% scholarship, attended college out of state for one year and then returned. I understand that he is still eligible for this scholarship although he must bring his GPA to a 3.0 or higher. How many years is he eligible after high school graduation? Also, must I complete the FAFSA form each year to keep this scholarship available? When will i find out if was awarded brightfutures? can I still apply for bright futures? You have to have the FAFSA form turned in by December, I believe. And by the way: If you’re black, lived in New Orleans, have Active/Reserve/Retired Military parents, or have low-salary parents, you have a better chance of getting other scholarships besides Bright Futures. does bright futures put into account the weight of honnors and AP courses wen calulating the GPA? How exactrly to i calculate my grades , including honors and AP to the Bright Futures Scale? is there anyway you can get your scholarship upgraded from 75% to 100% after you are in college? Mary: three years from the time he graduated high school if he hasn’t received funding yet, seven if he’s received at least one semester of funding from Bright Futures. You’ll need to get a reinstatement form and turn that in prior when he’s eligible again. suz and sharelle, the application and scholarship type are finalized before you graduate high school. It can be downgraded after that, but not upgraded. Angela: technically its supposed to be in by the time you graduate. Since its kind of close, you might try sending an application anyway… I kind of doubt it would be accepted but it might be worth the risk of the time you’ll spend. johnny, I’m not sure exactly. Its been a while but I think I got a letter. You can try calling the hotline if you don’t hear in the next week or two. gpowsang: I don’t know how your school calculates grades. The Florida statute says honors and AP classes should be weighted, but like I said, I’d have to know if your school changed the way it reports them in any way. which of these GPA scores are used for scholarships and are the AP classes he took already calculated into his score or do we have to add to these scores? John: Well, the state GPA would probably be the one used for Bright Futures. In this case, any of the GPAs could qualify for the top award so nothing to worry about. Each scholarship program will have its own favorite weighting, so they usually just ask for a transcript. My daughter qualifies for the 100% award. However, she went out of state for her first year. I believe that she plans on returning to attend a Florida school next year. What will she need to do? John: If she applied for Bright Futures prior to graduation then she’ll just need to contact state administration to update the file. Does Bright Future or Fasfa pay for housing? Even if it’s not on campus? (like nearby rented homes ect) Thanks! If I recieved the 75% Bright Futures Scholarship when I graduated from high school and I have been admitted into college in Florida for the fall session and my parents have to move to Georgia am I still eligible for my four years of Bright Futures? John: If you’re going to school in Florida then yes, you’re eligible. How can i find out ow many community service hours i have? I meet the other requirements for academic but I am not sure if I meet that one. My first child is in line to get the 100% Florida Academic Scholars Award: an unweighted 3.9 GPA (in IB), a 1400+ SAT and over 200 hours of community service. What exactly does 100% cover? The UF Web site says the tuition is $3,790. A co-worker says the award actually covers 75% of tuition, not the full 100%. Also, how does one submit the SAT scores? Have them sent directly the way they are sent to colleges? I am gaining two step daughters by marriage sometime next Spring. They are in 9th and 10th grade in Brazil and are academically very capable. I am a Florida resident. I assume they will have immediate residency? (Visa issues aside, a whole different question). What should I keep in mind to prepare them for an Academic Scholar Bright Futures? John: The most important thing is to make sure they take the right classes – especially language! Even if they already speak another language, its essential that they take 2 years of the same foreign language in a Florida public school! This one gets a lot of bright students disqualified so I would try to plan out high school courses well ahead of time. So I had the 100% Bright Futures, but then it dropped to 75% after one bad grade. With 75%, what is the minimum number of classes I need to take? I’ve read 6 credit hours, but I thought you had to be a full-time student to keep bright futures, and two three-credit classes doesn’t seem like full time at all. So I’m confused. Is it really only 6 credit hours? Full Sail is just another greedy corporation. They focus on the “top of the line” equip. and then when you cannot find a job, no wonder. Only the top %5 of films being made use the high-end tools and those jobs are occupied by people who have been in the business many years. This is only for film and their recording arts programs. If you’re thinking of attending for film, seriously look in to Valencia. They have a great program and once your a resident, the tuition difference is about $78,000. Full Sails refund policy is awful. They go out of their way to ensure you will pay top dollar, even for only one class. Happy hunting. I’ve only taken Algebra 1, Geometry, and Algebra 2. People have been telling me that I need to take a fourth math to even be considered for any of the Bright Futures Scholarships. Is that true or can I get 100% or 75% with just those three? John: You can get the 100% award with three math credits. I would still recommend taking a math class – if you skip math senior year it could be a lot tougher to get back into it when you get to college. Math is the type of skill that you can start to lose very quickly without some practice. My question is, is it guaranteed? I’ve met (will meet; I’m going into my senior year) all the requirements: SAT score, GPA, credits (again, pending due to my senior year), and community service. Assuming I apply on time and all that, is the 100% scholarship guaranteed? John: For now, yes. If the Florida budget gets too bad, they may have to cut back in the future but doing so isn’t politically popular. I have recieved bright futures and signed up for classes and bright futures paid for them, i may need to drop classes will i lose my scholarship? I took my first language class last year.They put me in an Ap spanish course,and my counselor told me that that course was worth 2 credits.is that true? Or do I have to take an Ap spanish literature class to get my 2 foreign language credits in order to eligible for the bright futures? I’m almost done with my 75 comm. service hours. I volunteered at teen court for my hrs. I know i was suppose to keep a log with 2 sentences, but I haven’t been doing that, what should I do. I did basically the same thing every week, juror or court clerk. John: I’d write out a letter stating how many hours you worked each week and for how many weeks, then get one of the teen court organizers or leaders to sign off on the letter. i would like to apply for the Academic scholarship, however already took the SAT and did not get the requirements ( 980 ). i know i can retake it but i want to know if i get a higher score the second time, will they use my highest score or the average of both scores ? Also, if i cant apply for the Academic , i am eligible for the Medallion schoralship but do i need 75 hours of community service to apply for the Medallion ? John: You can use the best SAT score. Even better – you can pick your best math and your best English score even if each was on a different test! The Medallion award does not require the community service. If I have a florida prepaid college program, will I be able to get funds from the bright futures program? For volunteer hours-are there certain dates that I would have had to volunteer in to qualify? Just in high school or before that to count? Facts.org has my sons weighted GPA for Bright Futures at 2.90. When I figure it I get a 3.33. How can I find out what grades they used to figure his GPA. I was awarded 75% florida bight future scholarship. I want to go to go to a community college but don’t know the number of the bright future so I can call and let them know what college I’m I ready to go so they can send it to the college. Please give me some information. Thank you and sorry for any inconvenience. Jessica Bravo. I want to thank you for this award it was a very big help especially with the financial problems my family has been having.. thank you very much…. John – don’t thank me, thank the taxpayers and politicians who voted to help out our hardworking Florida students. This program has been a great success and I see other states working to learn from it. If you want to help keep the scholarship for future students, you can help out too by voting for representatives who will support it! You can do it online, go to google, type in “Florida Bright Futures” it is the first link. I than believe you click on Application and Award Status and than from there it is one of those links, I can’t remember at the moment though, you can update what school you are going to attend or in my case I just transferred schools so I recently did this a couple of months ago to let them know what school I want the funds to be deposited into. When do the volunteer hours have to be done? Certain years in high school or anything before that? I had all the other requirements for a 100% scholarship but I was unlucky on my test scores. I missed the test requirement by a couple of points and ended up with the 75%. Is there a way to increase it to 100% now that am in college. Maybe by maintaining a certain G.P.A or something?? John – No, unfortunately I got stuck with the 75% too but for GPA rather than test scores. I would start looking for other small scholarships to fill in the gap. A few small awards can add up, even lead to a surplus. Does retaking courses on FLVS for grade forgiveness factor into the calculation for Bright Futures GPA? John – That’s a pretty good question and I’m not entirely sure. FLVS doesn’t have the best help section, I would say to check out FACTS.org and see if they hold the old grade or just show the new one. now that im in college (soph) and started get grades together (3.4) am i eligible to apply for any bright futures help or is it not available after you get out of high school? John – you have to be eligible for Bright Futures at the time you graduate highschool. There is, unfortunately, nothing you can do to get it after that. There are other scholarships available through private routes or from the school – and a lot of them like to see constant grade improvement so you might have a good shot! I had had maintained a GPA in high school for the 100% award, scored high enough on the SAT, and completed my community service. Two days before I went to register for my first term of college (I had graduated 3 months earlier), my counselor tells me, “Your math course doesn’t count.” I had taken liberal arts mathematics, and despite doing the same level of math as in a current Algebra II Honors course, the state of Florida does NOT consider it to be higher than Algebra I.
I lost out on my scholarship, no exceptions, because I’d only had the chance to complete Liberal Arts Math. PARENTS AND STUDENTS HEED MY WARNING: high school guidance counselors don’t know their head from their rear. Take your education into your hands, and use this to verify that the classes you (or your student) taken will count towards that scholarship. I now must pay for all educational expenses out of pocket, and work a minimum of two jobs, because my parents are unable to fund my education. Good luck and don’t let FL or your school screw you out of a this award. My son was told JR ROTC would count as a technical program credit. Senior year now and we have found out it does not count this way for Bright Futures so now he is struggling to make the higher score needed for the bright futures. Ask your counselor questions and then double check things for yourself…..
Do volunteer hours at a church count towards community service points? Our high school counselor says she doesn’t think they will. My son put in over 80 hours this summer!! John – They should! I know many of my community service hours were through church initiatives. Just make sure someone at the church can sign off on the time spent! I have the Florida Medallion Scholars Award. This fall will be my last semester of college, and I only need 9 semester hours in order to graduate. I have heard that if a person is in their last semester and does not need a full load of 12 hrs, bright futures will make an exception and still pay their percentage of the tuition. Is this true? John – You’re only ever required to take 6 hrs a semester, but you can take less than that if you need less than 6 credits to graduate. Sounds like you’ve got it more than taken care of – good luck, and happy graduation! I go to a community college. Do i have to be a full-time student in order to keep and use my 75% Bright Futures Scholarship? i have a 3.5 unweighted can i still be eligible? Hi! I received 100% scholarship because I got my IB diploma. I am currently out of state this semester but will be returning to florida for the spring semester of 2009. I was wondering if bright futures would cover me if I decided to do a two year community college program (therefore getting my A.A) and then transfering to a university to get my B.A? Thanks! Can I use my Florida Bright Scholarship in the state of Connecticut (75%)I went to a tech school in Tampa, Florida and finished my course in computers. I want to go for webpage design. I have relocated to Connecticut with my parents. Can I use the rest of my scholarship in Connecticut? John – No, unfortunately part of the purpose of the program is to get students to stay in Florida to attend college. It looks like John does not want to answer our questions and is in this just for the google ads. Take care John, Thanks for all the help you have NOT helped me with! John – Whether you realize it or not, you’ve made a perfect example of the type of customer mentality that won’t get much out of college. Here’s a few hints: The ads barely pay for the space this website is hosted on – and it definitely doesn’t pay me back for the dozen hours I work on this site every week. Students have to take charge of their own education. So I’m sorry if you’re disappointed with an absolutely free interactive service, but your questions should be answered now. Funny how you finally say something when someone says something bad about the site. John – I’m sorry, is there something I can help you with? I love constructive criticism – this website has been a great learning experience for me to learn all of the technical and behind-the-scenes work that goes into creating a site. But unless you can clone me so that I have more time to pay the bills AND write here, we’ll have to accept some sort of delays until I can find a free Saturday afternoon. I don’t want to make excuses, but I’ve kind of been dealing with the freaking’ hurricane that knocked down trees around my house on my weekends. My son missed the deadline for admissions to florida communtiy colleges this Fall. He has a Medallion BF scholarship. Can he enroll in a Florida on-line course of study like Everest and use his scholarship? He’s still in his Freshman year. John – Everest is one of the eligible institutions for Bright Futures, so if he can get into a program and take it online, the scholarship should help pay (as long as its for credits toward a degree). I am currently a high school junior and will graduate in 2010. By Dec. 1 2009, I will have all required credits except for .5 in Social Sciences, which will be attained in my second semester. Can I still apply for Bright Futures in December 2009, even though all credits have not yet been awarded. Also, In 8th grade I completed a Physical Science (Honors) class which shows up on my official transcript. Does that course count towards the scholarship? Thank You. John- Yes, you have to apply sometime between Dec. 1, 2009 and the time you graduate. I’m not sure about the physical science classs. Its listed on the official list of classes as a “core academic” class, but there may be some confusion when they review your transcript if the transcript makes any special case out of it. Ultimately, it should pass but the bureaucrats are notorious for unpredictable behavior. I would recommend taking another science class your senior year 1) to be safe, 2) to learn something new, 3) and to be better prepared to take science in college. I am a Florida resident on active duty in the Army. #1 Are my children eligible for the scholarship? #2 Is there a Florida high school counselor that can assits us with out of state high school requirements? #3 Is there some place we can verify if our children classess/transcript meets the requiremement? #4 Where do we send the application since my children will not be graduating from a Florida high school. Reading all the posts it makes me nervous to see that one little mistake no matter whos fault it is could cost my children the opportunity to be awarded the scholarship. 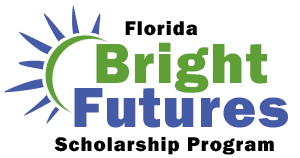 Unfortunately, the Bright Futures Scholarship requires the student to graduate in Florida or earn a GED in Florida. The only exception is in a reverse situation of your case – if you and your children were residents of Florida but you were serving elsewhere and that’s why they didn’t graduate from a FL school. I guess the up-side is that they would be eligible for in-state tuition since you are stationed here, but not the scholarship. Hypothetical question. Say I receive 4 credits for the same foreign language ( 2 more than requred ). In Spanish I – I get an A in the first .5 credit semester and a B in the second semester. Spanish II same grades. Spanish III same grades. Spanish IV same grades. As a whole, I would have a 3.5 GPA (Non-Weighted) for each year in which the credit was received. Am I able to mix semester hours from different years to get the 4.0 GPA ? John – It will help a little but it certainly won’t be much compared to the total tuition cost! How long is the scholarships for after you graduate? if i graduated in Georgia, but have lived in Florida for 6 monthes and am now a Florida citizen, can i apply for Bright Futures? John: No, unfortunately you need to have graduated from a FL high school, and you’d have to apply for Bright Futures by graduation. If i didn’t complete my two years of a foreign language in high school, but complete 1 year, is it still possible to do 1 year of that language in college and still get bright futures later on. John: I hate to break the bad news, but this is exactly why two of my friends did not get the Bright Futures award. You have to have the exact course requirements when you graduate high school or its no good. 1] Is my weighted GPA my HPA? and Is the weighted GPA what the florida GSV uses to be qualified for 75% bright futures? 2]I have a friend who was able to qualify for 75% bright futures with a 2.9 GPA…how does that work out? 3] my very last question… I slacked off my first years of highschool, I now have a 2.75 GPA, If I am able to obtain and maintain straight a’s for the rest of the year, will I be able to be qualified for bright futures (GSV)? 1) They do use weighted grades, I don’t remember the exact formula but I *believe* it is .5 for honors classes and 1.0 for AP and IB. 2) Its possible that 2.9 was an unweighted GPA? I’ve never heard of individual exceptions being made since the scholarship is written right into the legal code, but it could be that 2.9 was unweighted and the weighted avg. went up over 3.0. 3) Yes, it would be possible to get the 2.75 to a 3.0 in one year if you take as many classes your senior year as you did before then and get all As or maybe even with a few A-. Its also a good goal to reach for – just showing improvement in your grades from year to year will give you bonus points with other scholarship and grant programs. Florida Bright Futures doesn’t make exceptions for this, but other sources of money for college students do. John – I don’t think so but I’m not 100% on this one. I remember when I was in high school I looked into the GED but ended up choosing an adult continuing education program at the local community college, instead. From what I recall, you had to have actual course credits in the core requirements and the GED doesn’t quite give that. John- Its impossible to say fore sure… The state legislature can change the laws anytime they like, but this has been a very popular scholarship program and it is very hard for them to cut even if the budget is bad. I am currently a sophmore in College. I was awarded the Medallion Scholarship and have been using it since the moment I enrolled in the community college I currently attend. I don’t quite understand what this means though.. Does this apply to those students who are in High School and trying to apply or also to those who are in college and want to renew? I have taken Human Anatomy and Physiology I with the lab but I did not take Human Anatomy and Physiology II because I didn’t think I needed it, and took Oceanography instead (which doesn’t require a lab). Does this mean If I dont take another Natural Science that requires a lab I will be disqualified ?? Please help! Next semester is supposed to be my last semester before I graduate with my AA and knowing this would really save me!! John – My son is a sophmore in college and is struggling this semester. He is worried about loosing his Bright Future Scholarship. What is the GPA that must be maintained to stay eligible and is it the semester or overall GPA that determines eligibility. John: It is possible for some scholarships – but not Bright Futures! Hi, i have 100% Bright Futures scholarship, and am doing 12 credits right now, but I failed one of my classes and need to drop. Is there any way I can still keep my scholarship with 9 credits? Does taking a CLEP exam count as the other 3 credits I need, because if it does I will buckle down and pass it. Please reply back. Thanks so much. 9 credits is fine – in fact 6 will work. My son is in the Junior National Honor Society. He must complete 30 hours of community service hours for 7th/and 8th grade. Can he use these towards the service hours needed towards Bright Futures or must these hours be completed during high school years? This site is very informative and it highly appreciated. Im about to drop my math class, this being my 2nd attempt on it. Will I loose my scholarship because I dropped the same course twice? Or will I keep it and the 3rd attempt have to pay the fee out of my own pocket? i’m a freshman at hcc, and i applied for bright futures in high school, but my sat scores weren’t high enough. i was wondering if i took it now, if i was still eligible for bright futures? All Bright Futures eligibility decisions are based on the senior year application. The best way to get scholarships now would be to focus on maintaining a high GPA and being active with community service and local organizations. Make use of free scholarships searches like Fastweb and the one I’m trying to build up – and apply for as many as you can possibly find. The odds of winning are about 1:15 so the more programs you apply for the better your chances are. I qualified for 75% tuition with bright futures, but I went to school in Alabama so I couldn’t use it. I’ll finish my bachelors degree in Spring 2010 and would like to come back to Florida to get my masters in Elementary Education at FSU Panama City. Will I be able to use my bright future money for my masters since I never used it after high school? or are there any other scholorships they offer for people trying to get their masters? Bright Futures won’t pay for any graduate studies. Graduate funding is a lot harder to come by – there are some programs for teachers who go to graduate school, and most grad schools also have some room for graduate assistants who get paid a small stipend. What happens if you don’t take geometry in high school? I went from Algebra I (9th) to Algebra II (10th) to Advanced Topics(taking currently). I didn’t know they’d let you do that 😀 Technically its saying 3 maths, Algeba I and higher. I checked the official course listing and Advanced Topics does count as a higher course number so it should be enough for eligibility. I am currently military and a florida resident. I will be stationed in England next year. My son is a florida resident and will have completed his sophmore year of HS here in Florida when he joins me over there. While in England he will attend and graduate from an American (DoD) school. Is there a clause for him to be eligible for a Bright Futures scholarship or does he absolutely have to have graduated at a Florida school? John, thanks for information you have provided. I do not understand why some people complain about the lack of “answers”. It appears you have tried to answer as many questions as possible and I have gained a lot of knowledge from this site. I also believe those complainers will fail miserably when they are actually in college. While private colleges need to retain students to keep the revenue stream flowing and will hold students hands quite a bit, public universities will not. I have 2 degrees and have earned credit hours at 6 different colleges / universities so I know pretty well what it takes to pass courses. I am also an employer and look first and foremost for degreed applicants from public universities. I got a 27 on my ACT’s is there any way possible to qualify for 100% bright futures even though its only one point below? My son is currently enrolled in 4 (12 credits) at a public university using his Bright Futures (Gold Seal). This is his first semester and I am really concerned that his GPA is not going to be acceptable so we are contemplating having his withdraw from a course so his GPA won’t be impossible to recover next semester. I know that he is evaluated each spring for renewal. What are his obligations should he have to withdraw from a course this semester? (He has until 11/7 to withdraw. )Will he have to notify Bright Futures and pay the money back? John: I think there’s a limit of how many credits it will pay, so its up to you if you pay them back for a dropped course or have it count toward the limit. I graduated in June and enrolled for the fall semester at a comm college. I had to withdrawl and move back home in another town due to a living conflict. As long as I register for the next semester will my bright futures still fund the new comm colletge. I am getting conflicting information, the school I withdrew from says yes the new school says no. John: You should qualify unless a) your grades are too low to remain eligible, or b) too much time has passed. If your grades were low you may need to get them back up before you get the scholarship back. John I am currently enrolled at FIU and i recieved the 75% tuition from the Florida Bright Futures Scholarship for this fall semesterand i was wondering if after this semester i did not keep my 2.75 Gpa what can i do for the spring semester? can i re-apply for the scholarship after i bring my gpa up? John: There’s a grace period so one bad semester shouldn’t completely knock you off the program. If its your first semester going under a cumulative 2.75, make sure you get it over that by the end of Spring. I’m a Senior this year in high school, scheduled to graduate in May. I have complete all my course requirements, meet the volunteer service requirements, and I have a 3.9 (on an unweighted scale) and 4.1 (on a weighted scale). Despite several attempts on the ACT to get a 28, I have only managed to get a 26 (each time, I know, ridiculous). However, the three times I took it: First time, I had really high scores in English and Reading and then the second, I had high scores in Math and Reading, and the final time, English and Science were my highest scores. I was told by a friend that Florida Bright will take my highest score in each subcategory on my ACT (like my best Science, best English, best Math, etc.) and then added them together (then divide by four) and that would be my official ACT grade. If that is so, then I would have a 100% scholarship. However, due to the insanity of the Florida Bright site, I can’t seem to figure out if this is a true statement or not. So, my question, do you know how they take the ACT scores? John: I am reasonably sure that you can mix your best subcategory scores, at least they did for the SATs! I have the bright futures scholarship and Im attending Miami Dade. Right now i have four classes and by the end of the semester I will have 12 credits completed. but I have a problem I got teacher who is an assshole Im really thinking about dropping his class, but will bright futures take my scholarship away if I drop one of my classes? John: Nah, you can drop classes. I feel like I shouldn’t recommend that people drop classes, but I did it so much myself when I was in college. Of course you’ll probably need to retake the class, but it can be more useful to you if you happen to have a professor who teaches it in a way that connects to you. Do you know if the Doctor of Pharmacy program is considered a graduate program for purposes of the Florida Bright Futures Scholarship? Thanks! By the way, you have provided a great deal of worthwhile information on this site–thanks! If you meet all the requirements for 199% Bright Futures, but have a 27.5 combined on the ACT, does the state round up your score or do you have to hit 28 without rounding? I currently have the Medallion Scholarship, and have been using it to get 100% tuition at MDC. I’m now transferring to UM, which I know the scholarship will only cover 75% of. My question is this: at MDC, I had to pay the full tuition, and I later got refunded. Will it be the same for UM? At MDC it wasn’t a problem because of how inexpensive the classes were, but UM is a oompletely different beast. Paying the full tuition for that upfront is pretty much impossible for me. John’s reply to Jason earlier on this page suggests that as long as I pay the 25% required of me, the classes won’t get dropped. So does that mean Florida Bright will send the money directly to UM in that case? I’ve been trying to find out how this’ll work, but both the Florida Bright Futures and UM’s pages are fuzzy in this regard. John: The good news is that the money is coming in, the bad news is that each school’s financial aid department sets its own policies for how they do accounting and requiring tuition. You may be able to get a deferment once you’ve proven that you’re eligible for the scholarship, but its something you may have to work out with a financial aid adviser at the new school. I was wondering if you knew about standards about specific schools like UF and such, I already got into UCF with a 5200$ scholarship but that was with my old SAT score of 1230, I now have a 1300 with a 3.8 HPA (I already know I have the 100% Bright Futures so that wasn’t really my question) but my question was what were the requirements for UF summer, I’ve read the charts and such about 3.6 – 4.2 for summer and 1070-1300 but besides that I feel I’m a little low on the standards with a 3.8 but I have done over 13 clubs at my school (which I have been readily involved with all including JV Cross Country and Varsity Track), Hispanic, my Mother attended the University in the 80’s, and I believe form the responses that I’ve gotten from my Guidance and peers that I wrote a good essay. With your expertise in the college application pool, do you feel that I could get in or would it be based solely on my lower HPA. John: I’m not sure I understand – are you wondering if you would be accepted for admission at UF? I am almost certain you would be, but you won’t know for sure unless you try. Also what does science with substantial lab mean? Would Chemistry and Biology count? John: Who knows, its one of those definitions made up by a committee of lawyers working as politicians! Most chemistry and biology classes would certainly count unless there was no lab work involved. My question is.. I am almost done at MDC and next semester I will only be taking 3 credits because It will be my last semester and I have nothing else left to take. How will this work with my medallion scholarship? I know they won’t cover anything because I won’t be taking atleast six credits but, will something happen to my award? Or will it just automatically apply again when I transfer to FIU and start taking classes there? I am a advisor for a community based Teen Board. Alot of our Teens are getting conflicting information concerning their volunteer hours. Most of the teens on the board have 75 hours or more. When they talk to their school counselors they are told that their hours will not count because they did’nt do their hours fullfilling a community need or addressing a social problem. We are a city recreation center and these kids volunteer for community special events, and as teen counselors for our summer camp they also attend meetings during the school year. Any help or direction or insight you could give us would be most appreciated. John: Unfortunately, this is a pretty subjective issue. Make sure you provide the students with some sort of documentation, and include the nature & scope of the work and how the community benefits. This may be a way that the state cuts back on funding during economic trouble without “officially” cutting back on funding. If the guidance counselors won’t help students with their applications because they have an issue with the community hours, I would advise the students to personally work on the application and apply directly to the state. Hello John, my daughter is a senior with a Gpa of 3.5 and she did take the act with all passing scores, she also is a dual enrollment student and will have one semester to go after graduating high school to receive her AA. My question is she did not take the two years of foreign language, she only took one year is she eligible for the Bright Futures. John: Sorry, there’s no flexibility on course requirements. Two years of the same foreign language is mandatory, and a deal-breaker. Hi, I was wondering if Bright Futures is cut off immediately after you pass 120 credits? For example, If I have 113 credits and I’m planning on taking 15 credits in my last semester, so I’ll be graduating with 128 credits, will bright futures cover the last 8 credits? John: The scholarship will continue to fund you for 110% of your field of study’s requirements. If your degree consists of 120 credits, they will fund you up to 132. My son attends the University of Florida and is currently at the 100% level of Bright Futures. He just informed me that the Bright Futures is being cut back and he will now be at the 75% level. Apparently this is due to budget cuts for the state of Florida. Do you know anything about this? And btw, you have some great information and it is much appreciate by many. John: Hmmm, it sounds like this may actually have more to do with grades than budget cuts. If his GPA falls in between 2.75 and 3.0 he would be knocked down to 75%, I don’t know of any other cause for that. This may not be the case but its the only condition I’m aware of that causes an award adjustment. If it is the reason, he would be re-eligible if he got the cumulative GPA back to 3.0. Is is true that if you get an “F” in conduct at any time in high school, you don’t qualify for Bright Futures? Thank you! This website has been of great help! John: I haven’t heard anything about that, I think lettered conduct grades are school-specific. What are the different vocational classses that can be used? Does Art, or Photography count? My son has done the computer track but his girlfriend is interested in knowing what are other eligibility classes that also are considered. John: The vocational award is only for high school programs that are specifically denoted as a vocational program. Each district has its own set up for vocational programs – I know here locally we have a few for auto mechanics and carpentry but they are only offered at one particular school. For a normal academic high school track, she’ll have to apply under the guidelines of the other two awards. what are the maths that i could take to be qualified for the medallion scholars award? Just avoid math classes with class numbers lower than Algebra I has. And if there’s any doubt, check your high school’s class offerings against the state’s official course listing. Can you take summer semester courses to improve your GPA for renewal purposes? My wife and I have been FL residents for over 40 years, but due to some teen/home conflicts our son currently a senior, now attends a boarding school in GA. He has a FL drivers liscense and is still considered a FL resident. He will graduate from this private school in GA. Can he qualify for the bright futures scholarship? (can he challenge the FL GED?) He did attend a FL high school for most of last year. John: The statutes are pretty specific that he graduate from a FL high school, or earn the equivalent degree which is basically the GED. Would it be possible for him to register for the Florida GED prior to graduating at the school in GA? You might be on to a loophole here that I hadn’t thought of, but I have no idea if it would work out. will the bright futures scholarship help me pay for embry-riddle since it’s a private college. John: Yes, but the amount you’ll receive is limited to 75% or 100% of the corresponding public school tuition. Since the private college is a lot more expensive than that, you’ll have to find the difference somehow either through other scholarships or possibly through loans. It seems my question was “skipped” 🙁 ? I am a junior in high school and have been homeschooled all four years. I am planning on attending eckerd college (a private school) and the total cost is about 38,000$. Would that “Florida Academic Scholars Award” pay for all of that? (that cost includes on campus housing) Thanks! i just finished my first semester at a florida community college, but i didn’t do so well. i got a B and three C’s 🙁 out of high school i qualified for 75% bright futures i guess but i think im gonna be on probation for next semester. i have a 2.4 gpa right now, what exactly do i need to keep my scholarship? what gpa? I graduated from high school last year with the 75% scholarship, however due to the financial situation I was in I had to get a full time job and couldn’t attend school immediately. My question is now that I have been out of school for one year, will my scholarship follow me to an eligible college? Or did I miss my chance at it? I have the 75% scholarship and I passed all of my classes this semester but I failed one. Will I loose my scholarship? Is there something that I can do like take the class over again? Thanks for your help! John: Check with your college policies to see if they offer grade forgiveness. A few years ago, UNF would let students re-take a class or semester a limited number of times. It will depend on your school’s policy, but you may be able to get the F knocked off your record if you do better next time. If you recover within one semester, you may even be able to get back in good standing before the probationary period runs out. My very bright daughter and I have been discussing the effect of a juvenile criminal record on ones elegibility for Bright Futures. Could simply being in the wrong place at the wrong time (under age drinking or at a party with pot) that results in a conviction make her ineligible? John: There’s a federal policy making students with federal drug felonies ineligible for financial aid – I’m pretty sure Florida adheres to these standards. I don’t think a misdemeanor would make her ineligible, however. Hi, I posted here earlier. I have a 4.5 gpa but on my PSAT I did surprisingly bad. I wanted to know how hard it is to get the required GPA scores, in your opinion do you think it’s easy? and how hard is it to maintain a 3.5 (but I’ve read on this site it’s 3.0) in college. I don’t know anything about college and what classes you have to take. John: Well it depends on the school and the class and the teachers, but in general it shouldn’t be too hard as long as you’re attending class on time and doing the required assignments. For every hour of scheduled class time, expect to put in another two hours outside of class for that subject. Also, just wondering in college do you have to take like science classes if your major has nothing to do with it? Sorry, like I said I don’t know anything about college! John: Yeah, most schools require one or two math and science classes in the general education requirements. Some liberal arts schools have versions of science that are integrated into other subjects, so you might be able to find one that makes practical sense for your major anyway. iam currently in college, and i have the 75% i was wondering if i can retake my SAT and try to apply for the 100% once already in college? What SAT test does it require, b/c there are two different types of the sat test. i hope i didnt sign up for the wrong one! I just wanted to know, could you still be eligable for this scholarship if you not a resident of floridia? Would you have to be a citizen for two years? John: Only students who graduate from FL high schools and attend FL colleges, most of the statutes refer to a 12 month minimum residency defined by having a primary residence and employment in the state. I’ve qualified for another scholarship that is paying for my full tuition and costs. But, I’ve also qualified for bright futures. Do I decide what scholarship to use to pay for college? Also, if I pay for school with the other scholarship, will I get to put the bright futures money in my pocket or, never see a penny of it? John: It depends on the other scholarship – Bright Futures pays a set amount regardless of your other awards, but the other scholarship may or may not count that money into your expenses when deciding how much you get. If you did not do so well in your freshmen and sophomore years, although you did alright maybe like a 2.8 or 2.5 for those years although you got wonderful grades your junior and senior years and got high scores on the SAT’S or ACT’S, do you think you could have a chance for bright futures 75% maybe? Do you know which courses are counted when you’re above the number of required? I will have 4 math credits but this semester will be my lowest grade. Do they just take the highest ones or the last 3 you did in HS? John: Do you mean for the GPA? All classes are counted toward the GPA requirements, regardless of if they’re specifically required for scholarship eligibility or just for graduation in general. My son has a 3.0 unweighted but may not have it weighted is this a strict requirment? Also, when is the final deadline for applications for the upcoming freshman year? John: The weighted GPA would be higher, so if he has a 3.0 unweighted that would be fine. Applications must be completed & sent in prior to high school graduation. Hi. I have been slamming my head against the wall trying to make sure that my Florida Bright Futures – Merit (or now Medallion) award is credited to my school. So here’s my story ….. I graduated in 2002, went into the military, then got out recently in 2008. I have the paperwork that says I am eligible for bright futures. Did the FAFSA, Florida Student financial aid website, and va gi bill online. I should get credited my GI Bill within a few weeks. I recently called the Florida Bright Futures office and they told me I am supposed to apply for a reinstatement and not an initial app. So I just did that and tomorrow I start classes. And I have 10 days to pay the tuition or they will apply late fees. Now I want to make sure that I can use my bright futures this semester or I may just choose to wait for next semester… I have read also that it can only be used for one semester, is this true? And also I wanted to know if I start classes now and pay-out-of-pocket, will or can I be reinbursed when florida credits my school with the amount? I have read that it’s deposited the last drop/pay day? what does that mean? First, if you’re applying for reinstatement because you’ve already received initial eligibility, that sounds like a good thing. Second, Bright Futures isn’t limited to one semester – once you’re eligible its good until you either stop going to classes or your GPA drops below renewal requirements. Third, you would receive a check from the school for any amount more than you owe that Bright Futures paid into your account. So if you pay up full and Bright Futures sends a check for $500 to the school, the school will send a $500 check to you. Drop/pay day (we called it “drop/add” at my school) is probably the last day to pay before the late fee is applied, and the last chance to drop a class without having to pay for it. Here’s the thing I can’t answer: Will Bright Futures get your application in time to apply the funds to your account this semester? I have no idea! It probably depends how much paperwork is sitting on someone’s desk and whether or not they’re feeling productive this week. It sounds like you’ve got everything lined up and you’ve done what you need to do to be prepared. If you absolutely can’t afford to pay for the Bright Future’s portion of tuition this semester, I would recommend this: Sign up for your classes, show up to class, and find out if Bright Futures paid to your account on drop/pay day. If they didn’t, withdraw and drop the classes. If they did, pay the difference then before its due. One problem with this is that the lines are going to be crazy on that last minute day for paying and dropping classes. If you can afford it, I would say to just pay up for tuition and get started on school. Consider the bright futures a bonus if it comes in this semester, and sign up for a bunch of other scholarships instead of waiting around to see if it happens. In the past, being a National Merit Scholar or National Hispanic Scholar (with the proper community service commitment completed) has been enough to get Florida Academic Scholars. Is this still the case? My son has received Bright Future benefits (100%) which he has used on his on-campus housing. Now he wants to move to an apt. Can he use the Bright Futures for that? I live in Indiana. My kids are freshman and sophmore. They are both in their 2nd year of Spanish here. Will that meet the foreign lang. reqirement or will they have to take it again when we move? I am currently a junior going into my 2nd semester, i took french 1 in my sophmore year and i was wondering if i needed to take french 2 this year or if i could take it next year? John, what is the best way to coordinate both Bright Futures (100%) and Florida Prepaid (4 year university plan)? My daughter will receive 100% Bright Futures as she will be receiving an IB diploma, and she will be attending a public Florida University. We have a Florida prepaid tuition account we started when she was 5 years old. In my reading it looks like it is best to use the Florida Prepaid for Tuition expenses, then have the Bright Futures applied to room and board, transportation, etc. Is this correct, and if so, what do we need to do to make that happen? Thanks much, love your site! I moved to Florida from England 3 years ago. I’m a junior and on track to get the 100% tuition. I have all the right grades, classes, volunteer hours, languages, everything. My family has applied for permanent resident status (a “green card”) and hasn’t been turned down and we’re just down to the waiting stage, ut it’s taking a long time. It says you can get bright futures if you are an “eligible non citizen as determined by your post secondary instituition,” but I’m really worried I won’t get the green card in time and won’t get bright futures with out it. Do I need a green card (permanent resident status) to qualify? I could go to a guidance counselor, but I don’t like them and they are usually useless. John: Yeah, the waiting can be tough! If you know what school you are going to attend the best bet is probably to ask the enrollment offices there. Do you have to graduate from a Florida high school in order to receive bright futures, and can you apply after you graduate high school or do you still have to be in high school? Do we need to have a 3.5 GPA in all our years in high school. sorry i didn’t mention everything, I am a junior and now I have spanidh 2 without having spanish 1, so do i have to take spanish 3 to complete. John: the 3.5 is the required average of all four years, so if you’re under 3.5 on any year you’ll need better on another year to make up for that. As far as the foreign language, you’re probably going to need to take Spanish3. Technically, I believe the school district could waive the requirement since you demonstrated enough proficiency to skip Spanish1, but I wouldn’t count on that! Admins tend to be busy enough jumping through government-mandated hoops to sort through exceptions to the rule. will bright futures pay for me to go to university of florida? and what requirements do i need to meet to go to university of florida? John: Yup – 75% or 100% of costs depending on what award you’re eligible for. I’m not sure about admissions requirements at UF because the only way to know if you get accepted or not is to apply. They don’t go by a rigid scale of GPA or test scores, its more like a “big picture” consideration that looks at everything in your application file. I am the Valedictorian graduate of Chiefland High School-Class of June-2007. Currently attending IHOP in Kansas City, Mo. as a student in Bible Ministry. I am interested in continuing at IHOP as well as keep my options open for a Florida Bright futures scholarship. My phone# is 352-221-4439. My address is 4018 east 104th street, Kansas City, Mo.zip-64137. Please send me all the information you can about a Florida Bright Futures Scholarship and the Florida Medalion Scholars Award. I would also appreciate having a conversation with a scholastic counselor. Sincerely yours, Saralouise Autumn Gore Matheny. Please send to Saralouise Autumn Gore Matheny-Chiefland High School-Valedictorian of class of 2007 all info. available on the Fla.Bright Future Scholarship as well as the Florida Medalion Scholars Award to my address 4018 East 104th Street, Kansas City, Mo. zip-64137. My phone# is 352-221-4439. Thank you!! i would like to apply for the Academic scholarship. i’ve a bachelor degree in physical education and sport. I have the Medallion Scholarship. It’s the second week of classes (past the add/drop week) and I need to drop a class, and maybe get into another class. Can I drop a class with the Medallion Scholarship? Is that legal within the rules?? And another question, how can I determine with my scholarship will discontinue disbursement? Does it go by credit hours or something…. John: Yeah, you’ll need to be enrolled and complete at least six hours a semester. If you want to otherwise drop classes that you’ve paid for already, that is fine as long as you finish the required six credits each semester. can you tell me if you have to have only A’s and B’s on all high school classes? if you get even one C or below you can’t not qualify for the bright future scholarships? also do middle school grades count in any way? Im only a sophmore but i was hoping to graduate my junior year or halfway inot my senior year, do you still give out sholarships if you graduate early? If I am completrly with drawing from day school and I am starting all night school and some online classes, would i still be eligible for bright future scholarships? If one does not have social security….will they still be able to qualify for bright futures? How do you send your SAT test scores to florida bright futures? Do they just check them on their own or do you send them through mail or collegeboard.com? Also, about the transcript, do you have to send it electronically through your high school or can you just mail it? Do you have to send your seventh and eighth semester transcripts, or just one? Sorry, one last question, how do they verify that you competed your community service requirement (Is it through the transcript)? Thanks for your help:). I have the Florida Medallion Scholarship and I was wondering what G.P.A. I had to maintain to renewal next year (2009-2010)? Also, right now I am taking 4 classes worth 3 credits each totaling 12 credits, and I was thinking about dropping one of my classes, how would this effect my scholarship? i have all of the credits for everything. i am taking spanish 1 and 2 on line now. i will be long before may. but im a little confused about the labs with science. do you have to sign up for them seperatly or do they go along with labs you do in class? and how do i know who to talk to to sign me up for the bright futures medallion? Hi i have a 3.1 core gpa and am entering my last semester as a senior this year, i have applied for bright future and counslers have told me i got it. However i feel that i may drop to a 2.9 because i have senioridous and have been slacking off, no one has been able to give me a clear answer if i will lose my bright futures if it drops. please help thanks! hey i’ve heard from some that you have to use the scholarship you’ve received the following year.. like you have to start college THE NEXT YEAR for the scholarship to “work” and whatnot, but i’m expecting taking a year after highschool/before college to just travel? i was wondering if this really was a problem.. Does Bright Futures cover the Summer Semesters for schools such as UCF, UF, FAU, others that fall into this category. Always one should pay close attention to the requirements of this or any scholarship program. Small details can cancel eligibility, and the financial aid administrators won’t have the luxury of a personal relationship with you, the student. One missed class, or a few points on the SAT can make all the difference between paying tuition or letting the state pick up the bill. Even with the current budget problems, the bright futures scholarship is still be funding for upcoming college students. The program has been around for many years and helped many students pay for college and thankful to them. Not all of us is aware of the process you have to follow in order to get a scholarship and in their confusion many parents or significant others simply fail to save on thousands of dollars spent on the education of their children. Financial aid like scholarships and grants are basically money gifted to students or pupils to help them get through college or university and can be in various forms. They are different from student loans in the sense that they don’t have to be paid back. My daughter, youngest of 10 sisters, first of them to graduate June 2009, has a score of 1260 on her SAT. I am disabled limited income 62 years old so no resources to give her financial aid..(Help Oprah!) My question is where can she get the aid she needs in the state of Florida. It would not be fair for her not to get aid. Please help her.. I believe the Bright Futures programs are regressive, since students from more affluent families are disproportionately helped by these scholarships based on grades. It is likely that the Citizens’ home insurance program is also regressive, redistributing benefits from the less affluent to the more affluent. Hence, our overall system of taxation and welfare benefits in Florida is highly regressive. I just recently got accepted to UF, but because their fall semster was full i got in for their Summer B term. Does bright futures cover that term? If i am most likely eligible for the 75 percent do i also need community service hours or is that only for the 100 percent. I am trying to help my son with the bright futures. We thought we had the gpa it is 3.2 weighted and 2.7 core. Is the core already adding in the honors classes. Or are we waisting our time now. He graduates in june. He has taken only core classes all these years. Doing well in some and not in others do you have a choice on which core classes you can choose to determine the core gpa. It is my understanding that it is the core gpa that counts for the scholarship. Sir .. you are nothing short of being a saint to answer and re-answer the same questions again and again. I would suggest (in bold text) you direct your questioners (inquisitors?) to closely read previous posts and see whether or not their question has already been answered. I’m putting the finishing touches to your medal ..
Im 13 turing 14 on June 21st. I really want a bright future award scholarship. I was wondering if a can get in to fsu with one? My daughter received high school credits for Spanish I and II, but no letter grade (on her high school transcript, it appears as a “pass”). In Spanish III, she received a credit as well as a letter grade. Do you know if the Spanish I and II (credits but no letter grade) will meet the foreign language requirement. I heard on the radio that bright futures does something [not sure if it is a refund for books or another form of refund] for $600 ? My parents have been asking me to find out, and everytime I go to my college, they tell me to go to the bright futures website. Is this just some radio conversation that I heard wrong? I currently have a bright futures scholarship and am attending a community college. I think I might already know the answer to my question but I wanted to be sure. I am getting married and moving to Washington (hes in the military) before I have the chance to finish school and wanted to continue going to school in WA. My question is will I loose my scholarship since I am moving out of state, even though hes in the military???? I just checked the social science credits list and advanced placement World History is not listed on there (it’s on there for the class of 2009 and under which doesn’t help me). AP World History does not seem to come up on the list for the class of 2011 but regular and honors classes do. Seeing as I’m 75% done with the class there’s nothing I can really do about this. But I just need confirmation, is it true that AP World History doesn’t count towards a social science credit? > I WOULD LIKE TO TELLYOU ABOUT MY SEVER URGETO GET PHD DEGREE FROM YOUR COLLEGE FROM NOW I HAD MS.C IN SOIL &WATER OFAGRI &FORESTY COLLEGE OFMOUSL UNIVERSITY WHEN YOU SENT YOUR ACCEPTANCE ILL SEND MY PAPER AND EVERY THINGS ABOUT ME EVEN THAT IM LOOKIN FOR YOUR COURTESY HAVE NICE DAY ADIEU. Im graduating as a senior this year, and I have initially been awarded 75% bright futures, however I took the ACT again and 2 of my subscores got better. Does FL Bright Futures accept a combination of subscores, because if so i have a 28.25. Do they take writing? And how would i change my status if I deserve 100%? I am currently a senior and am eligible for 75% bright futures. I was very close to getting the 100% and was planning on taking it again on May 2nd. The only problem is that my school’s grad bash falls on that same day and I noticed it after I already paid for (no refunds) grad bash. The only other test date available for the SAT is the last one on June 6. Since I’m a senior and am graduating on June 4th, if I take the test in June, will that score count towards bright futures eventhough the test date is so late? My son is a junior these yr. My husband lost his job in September and I lost mine in December. We haven’t been able to find work here in Florida,if we have to move, can my son still be eligible for the bright future scholarship if he meets the requirements. Hello there. This is GREAT informaiton. My son is a sophomore… he took two landuages: Spanish I and Spanish II in middle school (7th and 8th grade) Will he still quailify for the Bright Future award, if he get all the other requirements? Or does he still need to take the two language classes in the same language all over again? I didn’t recieve bright futures while in high school because I was a point under requirements for act score. I have taken it four times and finally got 20. I was wondering if I am still eligable for Florida Bright Futures….? Can you begin gathering volunteer hours during the summer right before 9th grade? Thanks for any help! Can a Bright Futures Scholarship be used to attend a University outside of Florida? Will Bright Future Scholarship accept Fl virtual On-line Latin 1 and Latin 11, for the foreign language requirement? If my college program is a 5 year program where I walk away with a masters but do not officially receive my AA or Bachelors, can I continue to receive Bright Futures at the 75% at which I am use to? Say I maintain at least a 3.5 all the way through freshman-junior years and 3/4 of the senior year. If I were to fail an AP class (not required for graduation) for just the last nine weeks, would grade forgiveness erase that from my GPA? Would I not need to take the class again? and also, would I still be funded for the first three years? Do i need to score both SAT / ACT test or i maintain my academic records? My daughter currently has the FL Brights Scholarship and this is her first year using it. Does she have to re-apply each year for it or is she set for four years as long as her GPA is good and at a FL college? How many Credit hours do I need to renew my scholarship? I know I need a 2.75 gpa but how many credit hours do I need? BTW this is the vocational one. What if you are taking your Last year of Foreign language in your senior year do you still qualify? My daughter has a 3.5 unweighted G.P.A and 450 service hours. She is a senior and took the SAT’s twice and her highest score was a 950 with the reading and math combined. For the reading section, she recieved a 570 and the math a 380. Does bright futures look at the amount of service hours a student performs and gives the scholarship to this type of student (like my daughter), who tremedously is involved in her community but missed 970 by twenty points? My daughter is in ESE and is in the program merely for excess time for math test, for she learns math more slowly than most. Who would bright futures most likely choose, the candidate with a 970 and 75 service hours or the candiate with a 950 and 450 service hours? Isn’t 450 hours a sign of dedication to the community and 75 a lack of dedication to the community? Is it not more important to be involved in the community to help society advance for the good of humanity than to miss twenty points on a test? Is Bright Futurea a bureaucracy that is corrupted by simple regulations and will not examine the person as a whole? Anyone, feel free to respond. How do you send SAT test scores for Bright Futures scholarship? Do they check them on their own or do you send them through the mail or the collegeboard.com. My son has taken the test on May 2 2009 and they have posted the scores online but the full report is not available yet. Will they get the information on time? I received the 75% Bright Futures Scholarship, and am attending FAU, what expenses exactly does Bright Futures cover? I took one year off after high school before starting college and currently receive 75% bright futures funding. I just received my AA and was considering taking a year off before finishing up my last two years. Is it possible to put the scholarship on hold or will I lose my funding? Does the bright futures scholarship cover past the 7 year mark for school terms that we unused? I have been in college for about 2 years now, and am ready to transfer to UNF. I only needed 1 class this past Spring Semester, so I only had 3 Credit Hours. I submitted my renewal application only to find out that I am now ineligible for renewal.I’m not sure what to do. 1. Pay out of pocket at UNF, which is very expensive. 2. Take a summer course or 2 in Summer B to compensate and then submit my grades. However, I dont know how this works yet. I’m in a big dilemma with this. I work full-time and just really didn’t want to take silly classes to compensate. Can you help? Hi, you have very good information on this blog. Beats anything I have seen from so called “Financial Aid Planners” by a country mile. My question has to do with the site. Beginning on January 28th 2009, there are no more answers and yet people keep writing. This must mean that the way to read the replies changed and I dont know how to get to them? If I dont hear from you I will sadly have to assume that you finally got bored by people asking you the same already answered questions again and again. if the first time you take the ACT you have 20 in the math section and 19 in the reading section but you did bad in Sience and in English, and the second time you do good in the two you did bad, and bad in the two you did good, can they just take the best score only. i have a lot of questions and cant find an email nor a website to find my answer! To receive a Academic (100%) award with Bright Futures do you have to have a 1270 SAT and 3.5 weighted, or will a higher GPA (combined with the 75 hours) negate a lower SAT score? well , im going to be a senior in high school. i wanted to know if AP courses are counted for bright futures. for example im taking environmental science, and psychology. how about ap music theory?. also, is full sail in orlando a private school? For 75% scholarship, if i dont have the 3 vocational credits but have the 75 volunteer hours does that make up for it? Also, what is considered a vocational class? My son is 8/100ths…. from qualifying for Bright Futures – where/how can i challenge this to be sure they are pulling his top classes? My son has attended a private high school outside of Florida but is a resident of Florida. (It was a military boarding school). If his grade and test requirements are met does he qualify for Bright Futures? i got a letter n a couple months ago stating that they look at my act sat n grades n everything from my junior year until January of my senior year to see if i qualify for bright futures and i didn’t.. but i took act Feb.. and i got the score i needed. in the letter it said that i should be getting another letter to see if i qualify after school is over, i still didnt get a letter yet. do u know when im they suppose to send out the letters. I have taken l l/2 credit hours in French and now have moved to an area that does not offer French at my school. Can I take 1/2 a credit with Kaplan Virtual School and full fill the language requirements for a scholarship. This is my senior year and I must resolve this problem this year. Do you really have to have 75 community hours to qualify for this scholarship? You can’t have like 60 something and still be accepted for the scholarship? Question: May a student graduate from an accredited on line private school eligible for the Bright Futures Scholarship? The student resides in Florida. Are there plans to scale back the Bright Futures Scholarship Program? I have already graduated high school I’m starting college in the fall and didn’t qualify for bright futures but applied. I really need the money. I have Fafsa but I still need more money. I didn’t qualify for bright futures because my SAT scores were low but my ACT was a 19. Is there any chance that I can take the SAT again and have another chance? Im confused about when you apply and get denied or dont qualify the first time after you graduate if that means you can never get bright futures at all? My daughter is taking her 2nd year of sign language as a senior this year. We were told last year this was an accepted Language. Read in today’s (Daytona Beach News Journal) paper Bright Futures may be in jeopardy, true or false? My son has been in a private school from 6th to 11th grade. But, due to the economy he can’t finish his senior year there. So, we are going to home school him. My question is there any rules that say he can’t get Bright Futures because he hasn’t been home schooled before his Senior year. Can he still qualify for Bright Futures if he just starts home schooling as a Senior. do you by any chance know how you pay the last 25% of the florida medallion scholarship off? i received the florida medallion scholarship and am enrolled in a community college as a freshman and plan to transfer to fsu. is there a time you have to pay the remainder off by. like for instance, do they start charging you monthly at least 6 months after you graduate with your bachelors? im confused and would like to know how that procedure works out. thanks! Hello, I’m currently a sophomore in highschool and I was wondering, does Bright Futures pay the full tuition for private colleges? I ask this because I’ve been doing some research about it but I’m still not quite sure :/ I really want to attend the Ringling College of Art and Design in Sarasota but it’s quite expensive! Haha. My daughter recieved the MS which is suppose to pay 100%, but now Charlie Christ has changed that and it only pays 72.00 per credit hr. Our local 2 year college is 84.00 per credit hour. You have to have 24 credit hrs. finished in your first year. It is going to make it hard on my daughter to have a full course load and work 20 hrs. a week. I have a question. When you refer to the “verbal” section of the SAT, does that include both your writing and critical reading scores? I got a 1230 on the SAT with just math (560) and critical reading (670), but I got a 1970 with my writing score added in (740). Would I be able to qualify for the Florida Academic Scholars Award with that, or do I need to retake the SAT once more to try and get those 40 extra points? hey i have 4.00 unweighted GPA, 150 hours of community service hours, but my test score for the act is 26, are they gonna look over this or not? can i still qualify for the 100 %? How do you apply for the program? Is there an application online? hi i’m a college student and have almost 30 credits is there any way i can apply for the bright futures? i did not graduated in a Florida high school instead Ecuador. i have three math credits. algebra 1A, algebra 1B, and geometry. do i qualify for Florida Medallion Scholars Award ?? I have an issue. I applied to FIU for the Fall term (August 2009). They told me I was not accepted so I went ahead and enrolled in Broward College. I am now taking two classes there; all paid with the Medallions Scholarship. Now, I got a welcoming letter from FIU for the Spring Term and I am planning to go there. My question is: What should I do? Only one of the classes that I am taking at BC is transferable and I’ve only gone to that class once. Both of the classes are out of their withdrawn period with refund, but I have until the 16th of September to withdraw. Will I lose my scholarship if I drop all of my courses at BC? Of course, paying the government back for the classes. Will I have Bright Futures Scholarship when I begin at FIU? Thank you in advance. HELLO, NAME IRFANULLAH,,BBA(H) 7TH SEMESTER.NEED FINANCIAL SUPPORT. I run a site on the CLEP exams where I try to give study advice on the subjects. I have had a lot of inquiries where people wonder if they can use CLEP credits towards a scholarship. I always tell them to check with their schools but any other advice? I am a high school senior and will be attending college next year using the bright futures scholarship. My question is my parents will be retiring in 2 years and plan to move out of state. Will I still be able to continue using the bright futures when they move out of state or will I have to start paying out of state tuition? I have signed up for the minimum 12 credit hours per semester. I am going to fail a class. If i keep my gpa above the 2.75 limit and take extra credit hours next semester will I lose my scholarship? My son is graduating from UNC in NC this May after finishing HS in Florida. He is returning to Florida FSU for medical school. Is he eligible for any assistance?? I just moved to Florida in June of 2009 after graduation, can I qualify for Bright Futures for the 2010-2011 school year? Great post. Thanks so much for providing information about scholarships which are an essential part of any education. In addition to the sites listed, students should speak to their guidance counselors about scholarship opportunities. Need more information regarding the program. How many community service hours should my son have at HS graduation to be able to receive 75% Bright Futures? To qualify for the Florida Academic Scholars Award, do you have to maintain the 3.5 GPA for all 4 years of high school or just your senior year? I have a 3.7 GPA and a 21 for the ACTs and 430 for Critical Reading, 510 for math and 460 for writing would i be able to get the 75% tuition for FIU? I live in Hull, Mass and have recently heard (if true?) that there are Free Colleges in the state of Florida..
My daughter is interested in finishing her degree in Psychology and has finished her 4 yrs with very good grades and on the Deans list. Is there anything down there that could pay for her tuition?, if we (are thinking bout moving) relocate to Florida, to cover her tuition for Graduate School. The financial situation here in Mass is not good. I know nothing of this stuffs, I am only her mom. Whatever you can tell me would be appreciated. How long, on average, does it take to find out if one has recieved a Bright Futures scholorship? How do you send your test scores in to apply for Bright Futures? Do they check them online or do you actually have to send them in by mail? I have a question. If a student has an above average academic GPA (4.98), 75+ hours of community service but only a 1260 on SAT can they still be eligible for 100% scholarships? how important are our sat & act scores? by when do we need thoses to score? Yeah, if you want to prepare for CLEP exams, CollegePlus! has great CLEP practice exams. I am currently an active duty service member who will be returning to college in Florida while I am on active duty. Since I left college to enlist in the service, I am technically still eligible for this scholarship. Am I still eligible for this scholarship if I will be using it while on active duty stationed in Florida? Nashville has great schools. There is a major college relocating to the Cool Springs area sometime soon, in Franklin. What do I do with my 75 volunteer hours once I have them? hello dear, my name is vincent madumelu, from Nigeria. please am begging for scholarship to complete my education career.i wish it will be granted to me by the grace of God. Thanks and God bless you. I think it is unfair that the awards are based only on cr and math scores. The SAT now bases their score on cr, math and writing. Do you think Fl Bright Futures will ever follow suit and include writing in their criteria? It seems that if the SAT bases their scores on all three subject areas, then the BrightFutures scholarships should be based on all 3 scores as well. My daughter scored a 590cr, 610 math and 750 writing for a total score of 1950. However, her cr and math score of 1200 is not enough to qualify her for 100% BrightFutures. Does the Bright Future Scholarship apply to private institutions? If your child has 100% Bright Futures and Florida prepaid for tuition, how do the 2 coordinate? Which funds are used first? Can BF be used for books, room & board, fees, etc. if the bulk of tuition is covered by Florida Prepaid? I currently have the 75 percent scholarship but I might have to drop a class this semester. This will put me at 11 credits. Will I lose my scholarship and if I do lose it, can I ever get it back? For the Medallion Scholarship can you use your best individual scores for the Act composite score? how do you submit someone that you think deserves a mentor and a scholarship but they dont have the money? I have the right GPA but my sat score was a 940. I took the Sat this saturday and although I studied I am not sure that I did that well. I am taking the ACT April10 and Sat May2. Can I get the score of the best math in one sat combined with the best score of english from another Sat..Like combine score? One more question, I register at http://www.floridastudentfinan...../ssfad/bf/ online but what else must I do. Any paperwork..anything I need to do.whats the next step? Thank you so much and I really appreciate the time you dedicate to answer our questions. Hi can a illegal student apply. Live here all my life and I am going to Miami dade but really need the money. Can i apply if I live in florida all my live,attend a public highschool,have 3.6 GPa and the required SAT score and my family is really low income? or is there any scholarship or anything else I can do. I will be earning the Gold Seal Vocational Scholarship this year. I’m attending a public university in the Fall but I would like to major in Psychology, not the vocational classes that I qualified for this award in high school. Do I have to continue the vocational classes in college to keep the award, in addition to the 2.75 GPA or can I switch to my intended major – Psychology? I have a 3.2 weighted GPA and the eligibility status says im not eligible because of a low gpa…What does that mean? Ok, so yesterday I was sent an email notifying me that I qualified for the Medallion and that I got it. Now, right now, I only have 1 class that I’m not doing so hot. I might fail the class. Will the scholarship be taken away? Even if my other classes are A’s and B’s? Plus, it’s not a class that I need for the scholarship or graduation. The only problem would be that my GPA may drop a bit…. This may or may not have been answered,but does my bright futures count towards online classes? I went to high school in florida and applied to BrightFutures and qualified for 100% but then my freshman year went out of state to the university of buffalo..my family now lives in NY and i am looking to transfer back to florida (ucf or fsu) i was wondering if i still qualified for bright futures even if my parents no longer live in the state of florida, does that matter even if i already have the scholarship technicially? Is anyone working this blog anymore? John used to produce some great answers. Is he gone, or is it that I dont know how to view his answers? last post with an answer seems to be january 2009. Can anyone offer enlightenment ? My daughter has attended USF for the past several years and was granted a Bright Futures scholarship before attending. I also prepaid her college with the Fla Prepaid Program years ago. She had the prepaid program that did not cover books and dorm, we paid for that out of pocket. My question is: Since she was awarded a Bright Futures scholarship would it not have helped pay for those things? How is the money dispersed? I would like to know more infomation on this matter, where can I get it and speak with someone……….. I am from the bahamas but i attend i a florida highschool. i dont have my ssn am i still eligible? is there a list of names for those that got the bright futures scholordhip this year? I am noticing kids from high end private schools with 1300+ SAT scores are doing well in Florida Universities and getting B- to C+ for their efforts. If professors were giving out higher grades, the State ponies up more money for Bright Futures. Do you believe they are under pressure to deflate grades for financial reasons? I a, currently enrolled in the AICE program, and next year will be going into my junior year, and have yet to get in any community service hours, any suggestions? If my GPA drops below a 2.75 over the summer, do I lose bright futures? someone told me that CPT scores get factored in as well…is this true? the g.p.a.requirement, doesit start in your 9th grade year or your 1th grade year? G.P.A. DO YOU HAVE TO MAINTAIN A 3.5 EVERY HIGH SCHOOL YEAR (9-12) OR JUST YOUR SENIOR YEAR? Does 2 years of American sign language count as a foreign language? Does 2 years of american sign language count as a foreign lamguage? Bright Futures paid my school a certain dollar figure for me to use for tuition, say $1600. If I only use $800 of that tuition expense, will I personally be reimbursed to remainder? I just graduated and was supposed to have bright futures for the fall. but i took one summer class and got a low grade in it so my gpa is now below a 3.00. Do I loose my bright futures for the fall because of this? last fall I was awarded the Florida medallion scholarship, well in the spring I ended up making a 2.43 GPA. this summer I have made a 3.5 GPA, does this mean I still have bright futures? and do I need to send my summer transcripts or will my school do that? It is good that the university is offering scholarships to deserving students. This will help many students as long as they will do their best. I was wondering if you could tell me the minimum credit hours needed to keep 75% bright futures. I originally thought you had to be full time but I have also read that it is only 6 credit hours needed to still have bright futures cover your costs. I want to become a part time student next semester but need to make sure I will still have the scholarship. Thank you! My daughter will be going to a private school (high school). Will this be a problem in getting the florida bright future scholarship for college? i was about to ask the same question here .My son is going to private school (high school).Will this be a problem in getting the Florida bright future scholarship for college? Hey i have 2.996 gpa in weighted can i get florida medallion scholarship i get in the sat 990. My graduation year is 2011. If I have a 27.75 ACT combination (I divided my top scores- English, Math, Reading, and Science- from my 3 different sittings), would I be eligible for Bright Futures 100%? My community service is in the process? PLEASE I need to know if this will go up to a 28, securing my eligibility. I’m so happy. I think I got the scholarship! Now I’m worried. When you apply, do you automatically get the scholarship or is it like any other scholarship where there’s a “weeding out” process? If I get the 100% of bright futures, can I still apply for FAFSA? Thank you. Hi john, i’ve been reading the comments on this site and i apreciate you helping those people for all those years. i have a really simple question. i don’t know much about the florida bright future scholarship but i know that i have a 3.0 gpa and all the credit hours. i got a 19 on the ACT i plan on taking it again. is there anything else i need and how can i use the award after i get it? please send me your reply at roodleyricardo@hotmail.com thx. I just discovered your site, I actually saved it and i ‘m looking at the particular blogposts. I undoubtedly really like it. Fascinating topic in any event a person look at it. I come from the mindset which view reviews as akin of tuning in. I did bad during my fall semester and I’m afraid that I’m going to lose my scholarship. I heard though that they calculate at the end of spring semester… Is this true? My son graduated from high school in 2005. He received a bright future scholarship as well as a CAP scholarship. We would like to get a refund of the unused prepaid tuition program but they are requesting a copy of the award letter. I have not been able to find it. Is there any way to get a copy of the letter notifying and/or congratulating him on being a recipient of the scholarship? Could my bright futures scholarship disappear if I went to college out of state for 2 years, then finnished my other 2 years back in Florida? My daughter is in her second semester as a senior in high school. We just found out that her Liberal Arts Math does not count as a Math class for Bright Futures. We were not told this and it’s a pretty big shock at this stage of the game. Her GPA and SAT scores qualify her for the Medallion Scholarship and we were counting on that to help us pay for her college education. As there is only 4 months left to school for her I wonder if there are any tricks or secrets to get around the Liberal Arts Math requirements. She does not qualify for the Gold Seal as she did not take any Vocational classes. My daughter did start out in Pre-Calc and AP Stats and she was failing both, so we put her in Liberal Arts Math. Her Guidance Counselor did tell us that Liberal Arts Math may not be accepted as a 4th year of Math in “some” universities, however she never told us that it would not qualify for Bright Futures. Any suggestions? What if You didnt take all of those classs? Would you still be able to recieve the scholarship? I totally believe in CLEP programs to advance your college studies. Why do people not use this approach more? If you’re really serious about getting your degree fast, then it makes perfect sense to do all you can, to get your degree faster! Is a student from Cuba, who’s a legal resident and waiting to reside long enough to become a citizen, who also fullfills all other requirements be elegible for Bright Futures? I am filling out my Florida Bright Futures Application and I have gotten to the part of the application process that requires you to fill in your “self-reported approximate” GPA. It asks for both unweighted and weighted GPA (based on a 4.0 scale). I have filled out the unweighted part with a 3.5 (estimate), but when I enter a value in the weighted GPA, I have consistently gotten a pop up window claiming “The character entered is invalid. Enter the correct information.” Due to this peeving pop-up window, I can’t go on with my application. WHAT IS GOING ON??? That sounds like a database value error on the development’s end… like they only accept values up to a 4.0. Personally, I’d try using the unweighted GPA for both fields since that is the one that eligibility is based on. Otherwise, call the number on the application and stubbornly stay on the phone until they fix it or take your application verbally! The most important thing of all is to be persistent and committed to the outcome. Does Biology II/Forensic Science count toward meeting the science requirement for Bright Futures? We are currently Florida residents, and have been, but my daughter attends school in Thomasville, Georgia, only 30 min. from the Florida line. She is currently not eligible for the Bright Futures because of attending school out of Florida. One of my clients told me that for Bright Futures Purposes she could graduate with her class this year, receive her diploma, but then get a Florida GED for Bright Futures purposes. Is this true? I’m a senior, just recently reached a 3.0 unweighted. Can I only apply for bright futures before graduation or I can in the summer? because if I want to retake SAT’s and take ACT’s I don’t think I’ll get my scores back early enough to apply before graduation. also i meet the 970 requirement but it’s a 460 in math and 560 reading, is that okay or the math HAS to be 500? Where would I go to find a list of those who received the scholarship? I’ve tried to find the answer to this on here but can’t so sorry if it turns out to be a repeat. My daughter has been awarded the FMS. Her GPA is good enough for the FAS but her ACT scores are not high enough. The next ACT test date isn’t until after graduation. Can she re-take the ACT after graduation and if her score is high enough, will they re-evaluate her award and raise it to the FAS or is it too late once the award letter has been issued? I don’t get it. I have a 4.0 GPA and received a 1200 on my SAT, and it says I’m ineligible for the program? I’m enrolled in a public high school, so I don’t see what the problem is. This is so frustrating! Hey Bright Future helps alot! I have it and woah let me tell you it’s great! My son is a high school junior. I understand that the requirements were recently raised in order to receive the Bright Futures Scholarship in Florida. Can you summarize what GPA (whether it be weighted or unweighted) and SAT/ACT scores are necessary in order to receive either the 75 percent or 100 percent scholarship? Many thanks. My daughter finished school in 2009 and didn’t use her bright futures that she worked hard to get now she is going to a college in orlando and could really use all the help that is out there would she still be elgible for the bright futures. She lost he dad in the last year of school and had a very bad time of it for sometime. I would like to keep her on the right track. Is the weighted GPA based on the 15 core credits only? Or is it the entire weighted GPA? In other words, for medalion, does my son need at least a weighted GPA of 3.0 in the core academic classes, 4 english, 3 math, 3 science, 3 ss, 2 language? Or is it based on his overall weighted GPA being a 3.0 or above? Sir I AM DOING p.hd in soil science agricultural chemistry in pdkv akola in maharashtra in India. Where would I go to find a list of those who received the scholarship? hello i have the medallion one…(75%) but i am afraid am not doing good this semester in college. what happens if u gpa falls a little under 2.75?? can u re-apply? so i am a highschool senjor, and i messed up in school earlier in the year, now i have everything caught up and was wondering if it is still possible to obtain the 75% scholarship. or is there someone i can call to talk to? My family is looking to relocate to Florida this summer. I will be an incoming senior and will graduate in 2012. I will be enrolling in a Florida College for the 2012-2013 year but I will be applying for the Florida Bright Futures Funding earlier. One of the requirements says that I have to be a Florida resident. I have heard that you have to live in the state for 12 months until you are considered a resident and granted in state tuition. I will be establishing residency by this August 2011 and by the time August 2012 I will be on the college campus. Therefore, I will have been here a full year before I actually go to school, but when I apply for colleges and/or the Bright Futures I will not have been here a full 12 months. Am I still eligible for the Bright Futures Scholarship AS WELL as in state tuition? So glad I found this website. Very cool for us parents treading the waters of approaching High School. P.S. Glad you’re still doing this blog after two years! From our High School we received information that the IT and web design courses my daughter has taken in Middle school, these classes where taken as high school credits, and if she web design 2 her freshmen year than she automaticly quaifies for 75% brght futures. Is this correct? For the scholarship that is 75%, I don’t community service hours, right? that’s for the 100% one? What about the SAT and ACT? Do you need to take those for both the 100% and the 75%? If I have the GPA and SAT scores for the Florida Academic Scholars but not the ACT scores am I still eligible for the scholarship? If i missed bright futures with a 2.9 and not the required 3.0 in highschool an i am now about to start college is there any way for me to still get bright futures? My math classes have been Algebra 1 and 2, geometry, and math for college readiness. I am hoping to use alg 2, geometry, and math for college readiness as my three math credits (the grades were best in these three classes). Do you think this will be a problem? I improved my spanish 2 grade through florida virtual school. Will my first “poor” grade be dropped when my gpa is being figured? My son complete way more than 75 hours community services during his summers in high school. He did about 20 hours during school year. His counselor is saying his hours do not count because he did not do them this school year. I looked at several websites listing requirements and none of them verify her information. What is the correct requirement. Four credits of math are now required. Alg I, Alg II, Geometry, and Math for College Readiness all meet the requirements. Regarding the FL grade. Florida permits grade forgiveness if your course grade was a D or F. If you are trying to replace a B with an A it can’t be done. Your counselor would have to “X” out your old grade and “I” your new grade. I have never seen anything – anywhere indicating that there was a current year requirement for community service. Summer is a great time to complete community service. Having said that, school districts have a lot of sway in determining what counts as community service and what community service counts. It may be that the district has come up with a restrictive clause. For community service to count it must be recorded on the student transcript. Bright Futures will use your higest scores for a particular test. Either ACT, SAT, or CPT(in the case of Gold Seal) You do not have to have the cut score in each test. Another neat thing is that BF will mix and match scores on indiviual tests to get you to your score if needed. i.e. If you score a 20 for Act English on one test and a 15 for the math and then retake the test and get a 15 for English and a 20 for the math, BF will calculate the score as if you got a 20 English and 20 Math. Good deal, Huh. So to get the 75% scholarship you don’t need any community service hours? What is the earliest grade that students can start accuiring the volunteer hours for eligibility to the program? For Bright Futures what if i have the required gpa but i dont have the required test scores. does it mean that i wouldnt get bright futures or i will get the lower scholarship. Hi, quick question.. What if i got a 17 in math (which is the only subject that isn’t letting me get bright futures) would i be eligible for it? And is bright futures still doing the gold and what not programs or is it just one where you need a 3.5 gpa? I was awarded with the florida medallion award but on my own personal college account under finanical aid its not showing me as receiving any money. My fafsa and a grant from the college is showing up but not my bright futures. Has this happened to anyone else or does anyone know why? I live in a small town in Florida, and I have been thinking quite strongly about switching to Florida Virtual School, since the high school is not so great. Would I still be eligible to apply for the scholarship? I’m about to start my senior year in high school and the schedule they have set up for my senior class is horrible. I’m strongly thinking about going full time to the near by college (PSC) and going there full time. Doing that, I would be able to finish off my high school educational requirements, but I heard that bright futures doesn’t pay for people that have enough credits to get an Associates Degree. Is there some sort of college credit max they have set up? And also, would I count as a transfer student if I apply to UF after that? I heard that UF only accepts transfer students from FSU. I am currently in the military, Florida resident and stationed in Fort Lewis – Washington; my daughter will attend UCF, she is already accepted there, she has all the requirements (academic and community service hours), but she graduated from High School on 11Jun2011, Is it too late to apply for Bright Futures? Can this delay be waived? I appreciate your input, thanks. Do you know if Bright Futures considers Statistics and AP Statistics math classes? My school does, but UF doesn’t. Also, are Honors classes taken in Middle school considered honors in high school, or regular? I took Algebra 1 and Geometry in middle school (A in algebra 1, c in geo) and if they’re considered it could help. Does Bright Futures cover online classes? The SAT test has been around for many years, but SAT prep tools has not. And, throughout those years the same stumbling blocks have been basically the same. Namely, the MATH portion of the test ! Now this fact alone is enough to drive most test takers to some form of SAT prep tools. Fortunately, math appears to be the most coach-able and likewise the biggest difference maker to the test. Also fortunate is the fact that you have somehow found your way to, in my opinion, the best SAT study guide complete with sample tests and answers, on the internet. Focus on what needs the most attention and you will do fine. On what basis is the GPA weighed? Like does an “A” in a Honors class weigh more than an “A” in a regular class? What’s the scale? How do they find the GPA? Do grades for Honors and AP classes get more credit? i received a 1250 on the SAT with just math & reading. but i also took the writing section in which i got a 650. i know the florida academic scholarship only considers math & reading but i missed it by 20 points & i got such a high writing score. could my writing score possibly have me qualify for the academic scholars? you now need 100 service hours to get the FAS award, not 75 according to the florida bright futures scholarship program website. just wanted to keep this updated. I am a graduate from high school through IB program with a certificate. I am planning on retaking one of the exams to meet the criterion to obtain my IB Diploma which qualifies for 100% Bright Futures. However, by the time I retake, I would have already finished 1 yr of college with 75% tuition costs already covered by Bright Futures. Question: Will Bright Futures reevaluate my eligibility for 100% funding if I obtain my IB Diploma a year later after high school. Is the ship sailed to pursue this option? Please advise. Thanks. Can we use the Florida Academic Scholarship if we are going to a college out of state after graduation? What is the forgiveness policy for the medallion scholarship? For those with GPA calculation questions, our GPA Calculator is a great tool that allows you to organize, delete, and save your courses and grades. what if you messed up in you application on your social security # and you lost you SSN card. do i re apply? I finished “o” level, and branch for a course not becouse i like it but i dont have choice. Some one help to pay my tuition, unportunatly, he pass away before i finished certificate course. but i struggle hard to finish my course where i got certificate in secretarial studies. i wish i succeed and go back to school. I need your advise, incase i succeed, can i take IT course or Public Adminstration/accounting? My family and I have been out of Florida and living in England for 3 years. My husband is working for the UIS Military here and our daughter will be graduating from an American Department of Defense school next year. She is taking the SAT and ACT and completing her volunteer hours. My husband and I are Florida State residents with Drivers Licenses and a residence as well. Is there something that we will have to do differently in order to apply for the Bright Futures Scholarship because she is not graduating from a Florida High School? I have a client who is eligible for bright futures but was just arrested as a juvenile…will taking a plea to that offense make him ineligible for bright futures, even though it would not be an adult conviction? For those students who are considering a course in medicine or the health sciences, check out our website that will geve you all the information you could want on Dr Ross’s Human Anatomy Course. My son has Florida prepaid tuition was awarded ROTC scholarship for tuition at a public university in Florida also will qualify for bright futures at one level. What is the usual way that credit is posted and does balance cover room and board? I really dont want to take physics. All of my classmates say its required for bright futures but i want to take anatomy&phys then Marine Sciences. Do those count for the natural sciences i need? i have already passed Chem and Bio honors…. Hey, The Brightfutures site says that they accept test scores taken through June. If I take the ACT in June, can I use those scores to meet my eligibility for test scores? If i take the june ACT, my scores wont be back until 4 weeks after testing which will be sometime in the month after June. Anatomy and Physiology and Anatomy and Physiology Honors with the course codes 2000350 and 2000360 respectfully are both fine for Bright Futures Science requirements. Marine Science 2002500 also works for Bright Futures. Most would be juvinile convictions. I believe the threshold would be if it was a felony conviction. Hello John, I was just wondering that if I am taking 4 credits and am not recieving funding do I lose my bright futures for next year? I recently applied for the bright furture scholarship, but didn’t meet the criteria because of my ACT score. I retook the the ACT and got a 22 which does meet the criteria. Do I apply again or does it automatically change? Assuming that you are a current senior, and probably applied this past December, your notification was a preliminary notification. Your county will forward the new scores along with your new grades for Semester 8 automatically. There is no need to reapply. If we meet the requirements of one of the categories for bright futures, is it automatically guaranteed? You will always get the highest award that you qualify for – as long as you apply after December 1 and the last day of your senior year. I am currently in Trigonomety, and i didn’t really have to take the course. I am failing it right now, and it is pass the time to drop the course. Will i be put on probation, or will I lose the scholarship?? Ok I am a senior who will be attending to PSC for upcoming year and my family and I have been in Florida for past 2 years but my father just changed his license and stuff. Would that consider me out-of-state tuition for colleges and would that mean even though I qualify for Bright futures, I can’t get my grant? if i receive a bright future scholarship can i us it if i plan on going out of state? i am trying to figure out if i am eligable for this scholarship. if you could email me information so that i can do a follow up it would be much appreciated. when can i sign up for florida bright futures? im gonna be a freshman this year and i was wondering exactly what i should be doing. My daughter is currently in the application process for bright futures (she qualifies for the medallion). We signed up and paid for her classes for this semester; will bright futures reimburse us? My son took both his foreign languages (Spanish I and II) in middle school and we were thrilled that he had met his high school requirements for a foreign language. Does this mean, because he did not take the second course in high school, that he does not qualify for bright futures? If so, what is your recommendation? I hope to hear from you shortly as I could then know what to do this year if it’s possible to make up for what I see inadequate advice from middle and high school advisors. Thanks so much for this service. It is very helpful. I was born in Florida. My family and I moved to a foreign country when I was in 7th Grade. My parents still file taxes in Florida and we are all American Citizen. I am a Senior in IB with very good grades and would like to know if I have a chance of qualifying for the Florida Medallion Scholars Award or the Florida Academic Scholars Award. I took classes in one foreign language in 9 and 10th Grade, and took classes in another foreign language in 9,10,11 and 12. Will that satisfy the requirements for the two foreign languages. And can the student take any foreign languages that he likes or is there a exclusive list of foreign languages that the student has to pick from. Sorry I forgot to mention that in the first part of my comment, I am requesting feedback regarding residency elegibility. Sorry for the ambiguity. What if you have a felony charge but case was dismissed and handled non judicially no charhes were formally filed and the state attorney office did not prosecute case will you be elgible for bright futures still? My daughter is a student at Dr. Phillips high school and has completed 150 hours of volunteer service at a local nursing home. I know this is acceptable for bright futures. However could another High School West Orange High school make a different requirement and say it must be a not for profit institution? My son is homeschooled, and we are trying to make sure we meet the high school requirements for a Bright Futures Scholarship. He is finishing 9th grade now, and will be dual-enrolling at a community college in the fall. My question is in regards to a few “duplicate” classes he has to take. He has taken Algebra 1 and Algebra 2 at home, and will now be taking College Algebra in the fall. Does the college course count toward Bright Futures, since it is a college/AP course but still Algebra? We have the same situation for Biology 1, which he has taken here at the house, and will have to take again for college credit. Do we get to count both courses toward his science requirements for graduation? My daughter is a dual enrolled student and has taken Biology honors her freshman year, Physical science sophomore year, and college Fundamentals of Biology with lab her junior year. Is this going fulfill the natural science, with 2 lab requirements. College Scholarships and Financial Aid - What is the Difference?